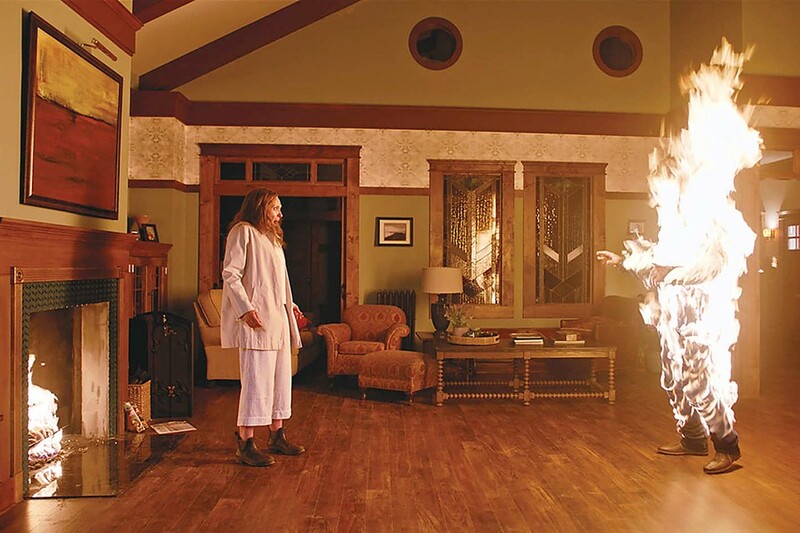 DEVIL'S DEBT Annie (Toni Collette) watches in horror as her loved one spontaneously bursts into flames. Glen Even though I've determined I can't be frightened by movies anymore, I still like to try, and I can say this about Hereditary: It's doing everything right! It's moody—a slow burn of tension and foreboding. When it resorts to sparingly used jump scares, they're very effective. The acting is stupendous! Collette is fantastic, playing Annie as a woman on the brink of a meltdown, who internalizes so much that her raw emotions can't help but burst out uncontrollably. Likewise, Gabriel Byrne plays her husband, Steve, with a quiet resignation. He knows Annie's been through a lot and is often on edge, and he does his best to understand, but he's close to his own breaking point. Kids can be eerily scary, and Milly Shapiro as 13-year-old daughter Charlie is perfectly cast. She plays a quirky child, odd-looking, off-putting, and in some non-specific way differently abled. Alex Wolff is her brooding older teenage brother Peter, who feels put-upon to include Charlie in his mostly awkward social life. This nuclear family is bubbling over with secrets, and this supernatural story takes cues from Rosemary's Baby, The Omen, and The Exorcist—all worthy influences. My problem is I don't believe in the devil or the occult, so it's hard to become scared of those ideas, but I still really enjoyed the atmospherics, acting, and direction. Aster, who until now has only written and directed short films, has an auteur's vision. I'll definitely go out of my way to see his next film, and I highly recommend this one. Anna I also find occult-themed films can't get me to that truly to-the-bones level of fright, but I imagine if you're a believer in such things, Hereditary may serve you on a whole other level than it did me. That being said, this taut, quietly electric film did have me riveted from the opening scene, and the next two hours were spent puzzling out what was really going on with these characters, this house, and their psyches. Colette is fantastic as Annie, a sought-after artist of miniatures, and the rapidly devolving world she lives in morphs her into someone else entirely. Her relationship with family is less than easy, and early on we learn that her mother was less of a friend and more of a burden in her life. Her mother and Charlie also shared a sort of secret connection, a point Annie finds both frustrating and disappointing. After her mother's funeral, Annie asks Steve, "Should I feel sadder?" Soon it becomes evident that while her mother may be gone from this world, she isn't gone from Annie's thoughts, and she starts to feel haunted by the memories lurking around every corner. Her relationship with Peter is a delicate balancing act. She's so frightened of doing wrong that she's frozen, and therefore a somewhat cold yet oddly demanding mother to him. The relationships in this film are the meat of it, and Aster has pulled off a complicated and delicate weaving of both fright and family. Glen This really is fine filmmaking. Annie's miniatures mirror her life. She uses the dioramas as a kind of journal or diary, chronicling everything around her. With her gallery breathing down her neck to see her progress before her next show, it just increases her stress. I don't want to burden Aster with the label "Hitchcockian," but he's got some important foreshadowing going on (and a penchant for including Hitchcockesque tension-filled music—think raw-nerved composer Bernard Herrmann-lite). When Charlie is lightly rebuked by her teacher for not doing her assignment, a bird crashes into the classroom window. Charlie is later seen picking it up and mutilating it in a way that gains importance as the tale continues. In another scene, Peter's teacher is talking about a Greek tragedy and asking his students what would be more tragic: having free will and making the bad choices that lead to the tragedy, or not having free will, making the tragedy inevitable? That's at the heart of this story: Is what befalls Annie and her family preordained? Aster moves the camera around Annie's miniatures, sometimes flawlessly shifting from them into the life-size rooms they're based on, and Aster also frequently uses tilt-shift camera tricks to make the real world look like a miniature. Is Annie no more able to control her destiny than the tiny figures she creates for her dioramas? If you're like me, you won't be frightened by the film's supernatural elements, but you will be wowed by the skillful execution of a dread-filled tragedy. 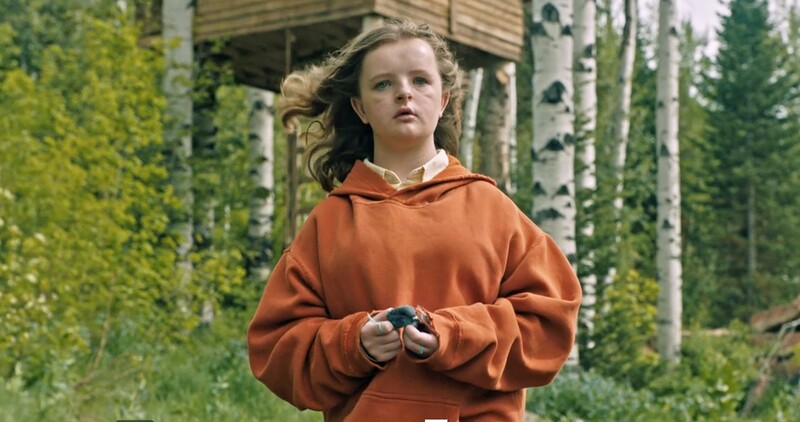 CREEPY Charlie (a perfectly cast Milly Shapiro) exhibits increasingly troubling behavior.